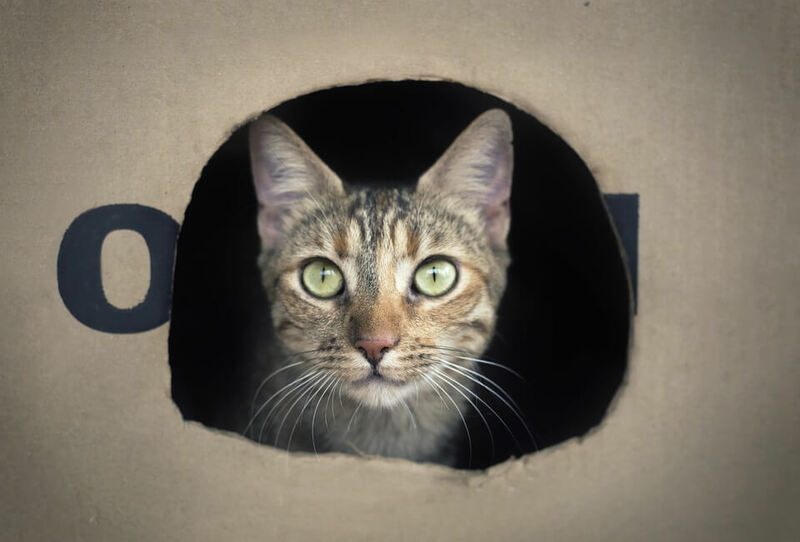 Have you seen your feline friend confining herself to a cardboard box or enclosed spaces? What could be the probable or most likely reason for that? One of the possible reasons is the innate behavior which they have retained in them. It is the inherent tendency of the cats to play with boxes. During the ancient times, these animals lived in the forest, and they badly needed a closed space to hide. These creatures are predators by nature. Usually, they camouflage to prey on their victims. Hence, they tend to put themselves out of sight. These cats, consider the boxes or laundry basket, a secure place to hide because no beastly animal can approach them stealthily, and give a tough fight to them. This way, they can secretly observe the surroundings. It will enable these furry friends to come out of their hideouts for a hunt and return to their places, safely. Most importantly, these places are a haven of comfort for these cats as they allow the cats to have an undisturbed sleep. These cats are hypersomnias, and hence they explore such places to have a bit of shut-eye. While you think of discarding the cardboard boxes, our kitties may be thinking of building a castle out of these junk boxes. Another reasonable reason for this behavior in your kitty is to de-stress itself. When your cat is annoyed due to some reason, it finds its refuge in these cardboard boxes. A study on cat behavior reads out that to adjust herself with her mood swings, she loves to play or hide in the boxes. These cats, who settles down in cardboard boxes cope up with the environment better and faster. Boxes can help your pet when you are planning to bring in another guest to your house or traveling out of town for a day or two. These boxes can secure your pet and keep them happy for a while. Claudia Vinke, a famous ethologist, made a study of two groups of domestic cats who were recently purchased by their owners. For one group, she gave different boxes, and for the other group, she didn’t provide cardboard boxes. She could see a significant change in the behavior of cats in both groups. The cats who had a cardboard box to play with and hide, acclimatized with the surrounding very soon. On the flip side, the ones who were deprived of their hideout, took a long time to familiarize with the changed surroundings. This study proved that cardboard boxes or confined spaces play an essential role in these fussy pets’ life. The main reason is the difference in the stress level that helped one group of cats to accommodate themselves to the new environment, fast. Lower stress levels in the cats enabled them to better adapt to their owners within a short duration of time. Another reason why your pet loves these boxes is the comfortable temperature inside these boxes. These animals have a body temperature that is slightly higher than their human counterparts. To cope up with the reduced heat outside, these cats hide in closed spaces. Usually, the temperature in these boxes is slightly lesser than outside. If your house has a temperature ranging from 85 to 95, she will not love to secure herself in these boxes. The Natural research council says that the tolerable temperature for your cats is up to a maximum of 97 degrees. The next time when you get annoyed seeing your cat perching near your car engine, don’t forget to increase your room temperature to 85 degrees. Usually, in our house, the temperature is only 72 degrees. For our furry pets, it is beyond tolerable limits! It is somewhere around 15 to 18 degrees above their threshold to withstand a cold temperature. So, these shoe boxes are plastic insulators that can help them sleep, peacefully. In between her naps, you should provide her with some interesting toys to play with. Why can’t it be a shoe box or a cardboard container which continues to amuse these cats, for a long time? Even the scientists find it difficult to explain the exact reason for this instinct in these animals. Is there any distinct reason that the behavioral scientists and biologists put forth to explain this behavior in cats? Scientists guess that these feline creatures are soft natured and tend to avoid aggressive encounters with their predators. Instead of giving a tough fight to their enemies, they retreat to hide in some places that their enemies can’t find out. Moreover, they are not well-built animals to fight and chase away their enemies. To run away from their predators, they hide in a shoebox or a laundry basket. Their tendency to flee from the place is the reason why they conceal themselves in a small container. You can buy boxes of different sizes and shapes for your pet from the nearest pet shop. Besides this, you can also grab some beds that are designed to provide a cozy hideout for your pet. You can place an open cardboard box facing upwards. It will encourage pets to play as well as climb up into it to sleep for some time. You can also place a very wet cloth to keep them comfortable. If you plan to be away from your pet for a couple of days, put your clothe that has your smell in it. Always remember to remove the tape, in the boxes to avoid an accident. In short, it is the instinct that draws the feline pet towards the boxes. They love to play with them as well as to hide in it. These are the remnants of the past. Their wild ancestors used to escape from their predators by burying themselves in caves, dens or other confined places. This behavior helped them to save themselves from their enemies as well as to attack their prey from their hideouts. The temperature inside the boxes is comfortable for them to provide them with a serene place to sleep. Do Cat Tails Have Bones?